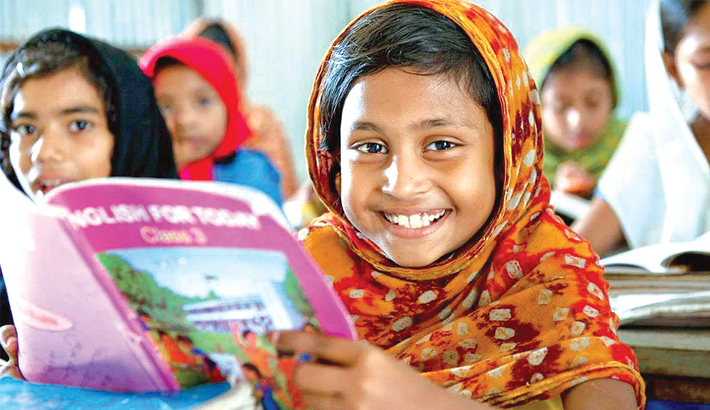 The World Bank Report titled ‘World Development Report 2018: Learning Realize Education Promise’ released on 27 February informs us t hat the learners of Bangladesh are lagging behind those of other countries in terms of quality education. A child of Bangladesh spends eleven years to complete secondary education since his/her pre-primary level. But she learns the same thing that the children of other countries achieve in six and half years. That can further be explained that the children of Bangladesh have to spend four and half years more than the children of other countries to learn the same thing. It definitely reveals a serious loophole in the first two tiers of education. The report presents the education situation of primary, secondary and tertiary level. It says only going to and coming from school does not mean education. About 35 per cent students of class three cannot read even Bengali well. Only 25 per cent students of grade five understand mathematics while 75 per cent don’t and the students from financially backward families belong to this category most. More than 31 lac students get enrolled in pre-primary school and out of them 49.8 percent are girls. The students who get enrolled in primary school, sixty percent of them complete the pre-primary grade. The World Bank has explained some of the causes of our learners’ lagging behind. The poor school management system can be attributed to the poor quality education. The overall expenditure for education is still lower than many developing countries. This news is well known to us. The people in power and their relatives and cronies occupy the posts of school management committee who actually don’t have any thirst for education or passion for education. Their prime target is exercising their influence in the locality and enjoying monetary benefits. It indicates that sound political decision is necessary to bring about qualitative change in our education institutions. In secondary level out of all teachers only 66.86percent are trained though this number shows three per cent increase from the previous year (2017). This percentage hardly indicates any sign of quality teaching. There may not be any guarantee or good relation between teachers just receiving training and delivering quality teaching. It cannot take place in the class until and unless the trained teachers apply the techniques in the classroom they have gained in the training session to bring about positive changes. Teachers sometimes take part in training programmes either under the pressure of the authorities or for monetary benefit, though not all teachers belong to this category. It is true that we don’t have any reliable survey or statistics or research on how many trained teachers apply their acquired methods and techniques in the classroom. The World Bank report also says that even one per cent budget for public universities is not spent on research purpose though research occupies a prime position in the seats of highest learning. Of course some universities get some allocation from different projects. It is the imperative to increase the research allocation in universities. Bangladesh Educational Information and Statistics (BANBEIS) Report 2018 shows us another report that says ‘though the dropout rate has decreased in the secondary level, still 37.62 per cent students drop out before completing their ten grade. The rate of dropout rate of boys has increased two and half per cent within a span of one year that is 36.1 per cent which was 33.43 per cent in the previous year and girls’ dropout has decreased less than one per cent, it still stands as 40.19 per cent. In 2011 the causes of dropout were identified as guardians’ low income, child marriage and poverty. The girls who get married at a teenage age, ninety per cent of them drop out. It has become a practice that the teachers of primary and secondary have to remain engaged in activities that go beyond their academic activities such as conducting election duties, different survey and collecting various data. It definitely helps develop their other skills but already most schools are affected due to shortage of teachers. The Education Minister has said, “whatever we do and fix, quality education is the prime factor.’ When we talk about quality education we must mean not only to teach in the classroom and only teachers and their efforts. Quality education rather means a vast thing. There is no short cut to it. Teachers, students, people of education working for government, school management committee and above all the whole education management go with it. The contents of the report released by the World Bank might not be absolutely the original picture of our education but some of the facts they have expressed definitely tell the realities. Though almost hundred per cent children of primary level get enrolled in schools, the quality still remains a far cry that is not unknown to the government officials of education sector. Teachers’ deliberate absence from the school and classroom has posed a big question. Students of all levels including primary level have to go to coaching centers regularly. Quality and experienced teacher crisis prevail in the primary and secondary levels. The current assessment system must be seriously revised and reformed to really identify the ability and competency of the learners.